that their sixth annual fundraising “Lobstah Bake” will be held on Sunday, August 5 with two different seatings available at 1 p.m. and 3 p.m. The lobsters arrive fresh from a Vinalhaven lobster boat the morning of the event and the meal includes one lobster, ½ pound of steamers, corn on the cob, potatoes, coleslaw, blueberry cobbler, and lemonade. Tickets are $20. The same meal with two lobsters is $25. A hotdog or a hamburger meal, with the same side options, is also available for $10. Single lobsters to take home are also available upon special order for $5 each. 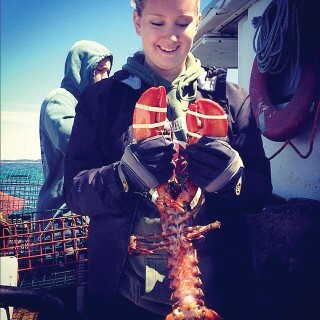 Lobsters fresh from Vinalhaven. Order yours today. “This fundraiser is really an event for the whole Windham community - not just the members of our church,” stated Jane Field, Pastor of Faith Lutheran. “It's a chance for old friends to reconnect and for new friendships to form as people gather under the tents to enjoy delicious lobster caught just hours before in Vinalhaven. Everyone in our congregation gets involved in putting this on, and you can really see the incredible spirit of hospitality and welcome that is at the very heart of their faith. The money we raise goes to support the work of the church, including our ongoing involvement in the Monday Meals Program and our extraordinary music leadership program for teen artists; led by our beloved and phenomenally talented Music Director, David Hansen, and our audio and technology expert, David Muise. The sign out in front of our church says, ‘All Are Welcome,’ and that's true every Sunday - but it's especially true on Sunday, August 5 when all are truly welcome to join us in enjoying great lobster and supporting a good cause." To place your order for “Lobstah Bake” tickets or for lobsters to take home, contact Melinda Zimmer-Rankin before July 31 at 749-9503.